Stand on the front lawn at Belmont Abbey College and face the world. Cars hurtle past on I-85, so close you can smell rubber and diesel. Now turn around and face inward. The Abbey Basilica of Maryhelp, the main church on campus, has been there since 1892. Back then, the only road out was a rutted wagon path. Horsepower came from horses. Step inside the basilica and close the door. The highway sounds disappear. All you hear is the fountain in the corner, and a man in the back whispering prayers. Belmont Abbey, 10 miles west of Charlotte, is full of contrasts. It’s a Catholic college where about half the students aren’t Catholic. It’s a modern campus built on Benedictine tenets that go back to the sixth century. It’s a place where students pass through in a few years, while a group of Benedictine monks — 21 of them at the moment — have committed to stay for life. The Abbey has about 1,600 students. It doesn’t feel like that many. So much of the campus is designed for quiet. The basilica. 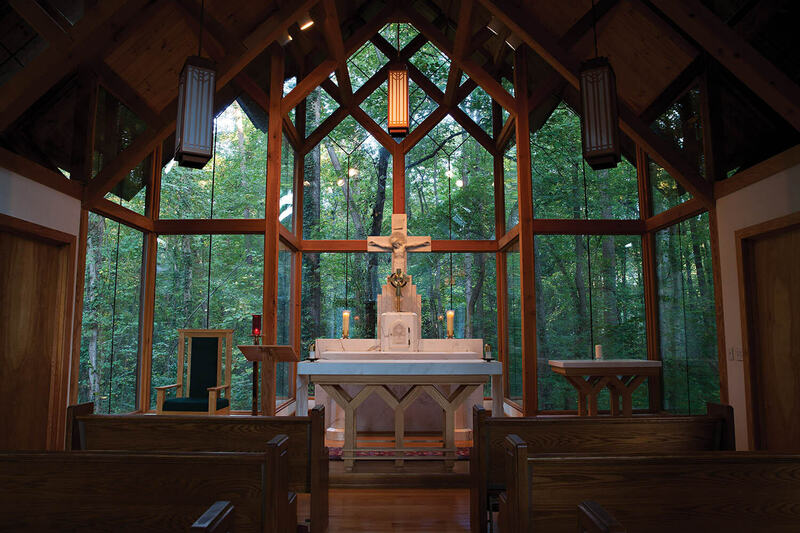 The St. Joseph Adoration Chapel, created for students and the public. The Lourdes Grotto, built so monks could pray for a young colleague with typhoid fever. The campus cemetery, where those who served the Abbey come for their final rest. They make room for silence at Belmont Abbey. A lot happens in the spaces between. In the 1860s, North Carolina wasn’t exactly overrun with Catholics — there were fewer than 800 in the whole state. Father Jeremiah O’Connell, O.S.B, a missionary priest, came anyway. He had founded Saint Mary’s College in Columbia, South Carolina, but it was destroyed along with most everything else in the city when General Sherman went through in 1865. O’Connell had the idea to find North Carolina land that he could donate to a religious order to start a new school. Over the next several years, as he rode through North Carolina as a circuit preacher, he looked for the right place. Finally, he came across a 500-acre farm in Gaston County that was being sold for back taxes. O’Connell bought the land and went looking for a religious community to develop it. He found a taker in the Benedictine Monks of St. Vincent Archabbey in Latrobe, Pennsylvania. In April 1876, the first monk arrived with two students. They started classes right away. More monks arrived, and they literally built the campus, forming bricks out of the red clay. From the outset, the monastery and school were linked. The monastery grew enough to be designated an independent abbey in 1884, and its first elected abbot, Leo Haid, is considered the college’s true founder. Back then, it was called St. Mary’s College, and the town just to the south was called Garibaldi Station, for the man who built a fueling station for the trains that came through. The town eventually changed its name to Belmont, and the monastery and school both became Belmont Abbey. Local history includes several competing stories about how all that happened — it’s not 100 percent clear where the name Belmont even came from — but by 1913, all the names lined up. The monks spend most of their days on more traditional activities. They set aside time for reading and reflection; they celebrate a daily Mass and a set of four daily prayers called the Divine Office; they recite all 150 psalms every week. Student life, for the most part, is similar to most other colleges. The Abbey has a quirky spring formal — the college picks up students in buses and takes them to a new secret location every year. The school also has its legends. The story goes that if you step on the Abbey seal, embedded in the walkway outside of Stowe Hall, you’ll never graduate. Melody McClure, a senior government and political philosophy major, gets up once a week to attend Lauds, the 7:30 a.m. prayer. McClure isn’t Catholic, but she finds peace in the moment, and she knows most of the monks by now. Father Kieran Neilson, O. S. B., who was ordained at the Abbey in 1960, sometimes takes students to Tony’s in Gastonia for ice cream. Abbot Solari, who has been at Belmont Abbey since 1974, often sees students from 30 or 40 years ago. There’s a reason he remembers. Colleges, like people, go into slumps. Belmont Abbey was slumping in the early 2000s — enrollment was down to fewer than 800 students. The board of directors decided the school needed someone with a business background. That’s how a guy who used to run a barbell company ended up as president of Belmont Abbey. His name is Dr. Bill Thierfelder. He’s 6 foot 8, a former high jumper, and a smooth talker who’s worked with NFL players to improve their performance. (His office has a collection of helmets from his clients.) 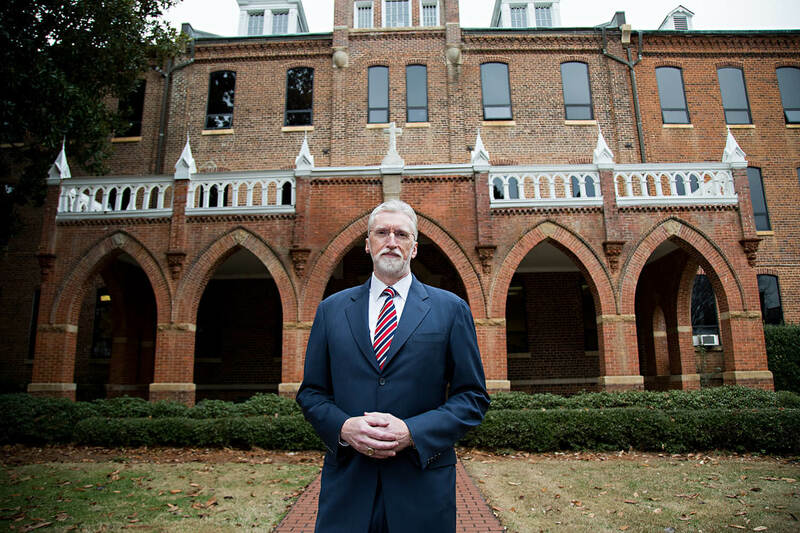 Within a few months of his arrival in 2004, Belmont Abbey raised $5 million to put computers in classrooms, increase tutoring and internship programs, and create a coffee shop on campus called Holy Grounds. The school added six sports and several academic programs — with help from Humpy Wheeler, Belmont Abbey now offers a major in motorsports management. And last year, the school cut its tuition by a third, from about $27,500 to about $18,500. Now the enrollment is roughly double what it was 10 years ago. Thierfelder knows that not all of the Abbey’s students share a particular religious belief. Some might not be believers at all. So he also talks in broader terms. “Virtue” is a big word at Belmont Abbey. Thierfelder describes the word simply as the habit of doing good. He wants students to learn the habit. He believes it’s already inside them. You mention that you want to learn about Belmont Abbey, and everybody says the same thing: Talk to Simon Donoghue. Simon isn’t Donoghue’s birth name. His family knows him as Jim. But Simon was the name he took when he went to Belmont Abbey to become a monk. 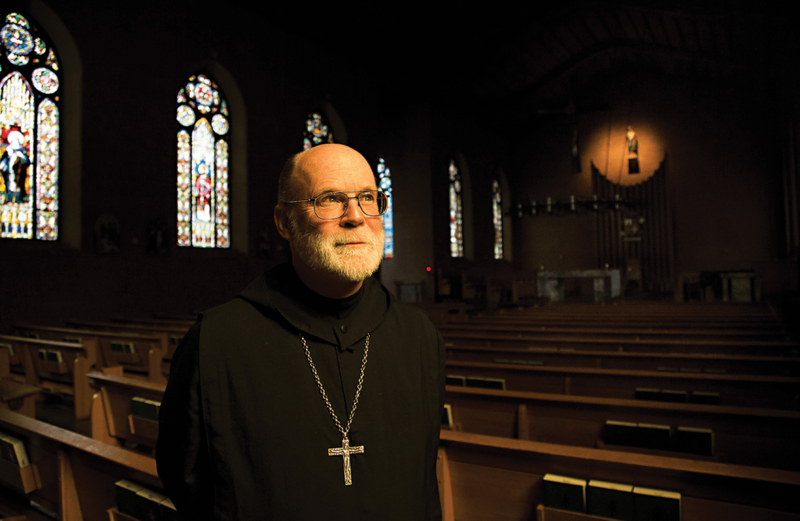 After four years of the monastic life, he decided it wasn’t for him. “Catholicism stresses reason as well as revelation,” he says, and he thinks a lot about how he’s seen the two work together. A lot of Belmont Abbey’s students are from the New York area, and many had family and friends near the World Trade Center on September 11. The college canceled classes that day, and students sat on the lawn, stunned. Donoghue remembers the monks working their way through the crowd, giving consolation. Donoghue has built a well-respected theater company, and has had offers to work in bigger places for more money. But he doesn’t want to leave. And he’s kept his Belmont Abbey name.